The globus cruciger (Latin) is an orb (globus) topped with a cross (cruciger), a Christian symbol of authority used throughout the Middle Ages on coins, iconography and royal regalia. It symbolises God's (the cross) dominion over the world (the orb), held under the protection and dominion of an earthly ruler, or sometimes celestial being. The visual symbolism of holding the world in one's hand, or perhaps even more ominously under one's foot, was a clear message used since antiquity among pagans. Citizens of Rome were familiar with the plain round orb as a representation of the world or universe, and the emperor's dominion and protectorate over it; for example a 4th century coin from the reign of Emperor Constantine I shows him holding a globus in hand; and a 2nd century coin from the reign of Emperor Hadrian shows the Roman god Salus with his foot upon a globus. 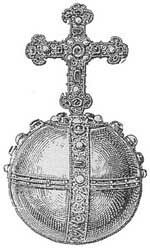 The Sovereign's Orb is a type of regalia known as a globus cruciger and is one of the British Crown Jewels. It was created for the coronation of Charles II in 1661 at a cost of £1,150. The Orb is a hollow gold sphere weighing 42 ounces and about 6.5 inches in diameter. Around the centre is a band of pearls and gemstones. There is a similar half-band running across the top half of the Orb. Atop the Orb is an amethyst surmounted by a Cross. The Orb is a religious symbol; it represents the Monarch's role as Defender of the Faith and as Head of the Church of England. During a coronation, the Archbishop of Canterbury delivers the Orb to the Monarch's right hand. The Orb is then placed on an altar, where it remains for the remainder of the ceremony. 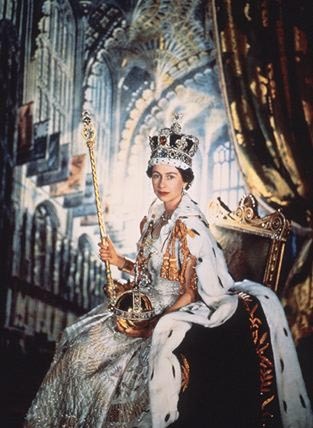 At the end of the ceremony, the Monarch holds the Orb in the left hand, the Sceptre with the Cross in the right hand, and wears the Imperial State Crown as he or she leaves Westminster Abbey. Amethyst is the birthstone associated with February. It is also associated with the constellations of Pisces, Aries (especially the violet and purple variety), Aquarius, and Sagittarius. It is a symbol of heavenly understanding, and of the pioneer in thought and action on the philosophical, religious, spiritual and material planes.